Kimberly KJ Morris, one of victims of the Pulse nightclub shooting to be laid to rest, is carried to the grave site on June 16, 2016. 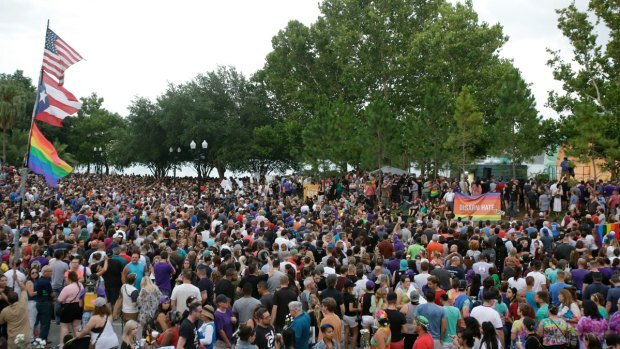 The first funerals for the victims from Sunday's massacre were held Thursday, the beginning of a long procession of grief through the heart of Orlando, NBC News reported. Kimberly "KJ" Morris' family held a packed funeral service at Osceola Memory Gardens Funeral Home for the 37-year-old who they said will always be remembered for her "big, bright smile." "This past week we've been watching so many videos of our loved Kim and it just rings out in my mind as we are watching those videos, 'Go Kim! Go Kim! Go Kim!' and that was her personality: smiling, laughing, music, let's dance," her uncle, Bryant Johnson recalled. "Kim loved to have fun and she was often the source of it." Several friends and family members stood before Morris' white casket counting the ways she will be missed.